A great part of our journey across America has been learning about the interests and passions of our friends. 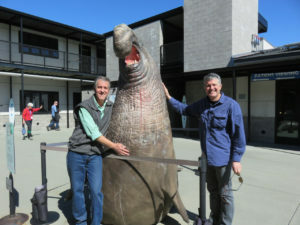 When we hung out with Mark in the Sonoma, California area, he took us down to the Marine Mammal Center near Golden Gate Recreation area, right across from San Francisco. The center “is a nonprofit veterinary research hospital and educational center dedicated to the rescue and rehabilitation of ill and injured marine mammals – primarily elephant seals, harbor seals, and California sea lions.” When we visited the facility, there were about twenty pups being rehabilitated for return to the wild. According to John, one of the many volunteers there, about fifty percent of the animals they rescue are successfully returned to the wild. One of the more fascinating stories he told us was about Astro, an endangered Steller sea lion. Like many other residents, Astro had been somehow separated from his mother before he reached a weaning age where he could survive on his own. He was only 39 pounds and still had his umbilical cord attached when the center brought him to their facility in June of 2007. A typical pup of his age weighs around 75 pounds. The center does their best to get their charges to a healthy weight and prevent them from becoming habituated to humans. When we visited, we watched some of the residents from a balcony. Staff were feeding them “fish smoothies” and water to keep them from becoming dehydrated. Species that more easily bond to humans are housed farther away from visitors. Astro lived at the center until April of 2008 when he was released with a radio tag. After returning to San Francisco Bay and trying to join beachgoers on the shores of Corte Madera—near San Quentin, the center took him farther offshore and released him in the Farrallon Islands. Undeterred by this rejection, he returned a week later to Corte Madera. This time he spied children from the Marin County Day School participating in a walkathon on their track on the shores of San Francisco Bay. The friendly sea lion joined the elementary school children in nearly a full lap of the fundraiser. Since Stellar Sea Lions eventually grow to be 11 feet long and weigh 2500 pounds, staying at the school as a mascot wasn’t an option. 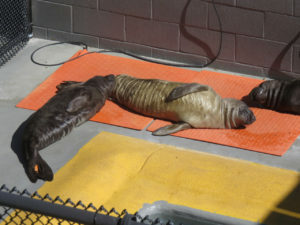 The Marine Mammal Center retrieved their errant charge. The story has a happy ending though. Astro found a home at the Mystic Aquarium in Connecticut where he entertains and educates visitors. Alas, he no longer participates in walkathons. 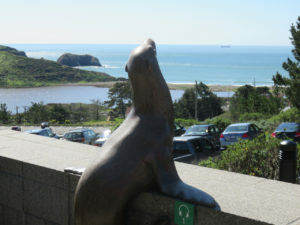 To learn more about the Marine Mammal Center, and even support their efforts, go to http://www.marinemammalcenter.org/ If you’re in the San Francisco Bay area we highly recommend a visit. Trip Update. We’ve traveled all the way to Las Vegas where we’re meeting up with a friend we haven’t seen since our Air Force days in Germany–back in 1991. We’ve had a chance to see other friends in the the Santa Maria/Vandenberg AFB area, and cousins east of Los Angeles. Spending the next few days in Mesquite, Nevada to visit with Laurie’s Grandmother and friends. Thank you for the wonderful story about Astro. I’ll be sure to visit the center when in Northern California. Well worth a visit, Debbie. And there’s also a Nike Missile Site museum and great views of the Golden Gate Bridge nearby.